Kittridge, you've never seen me very upset. 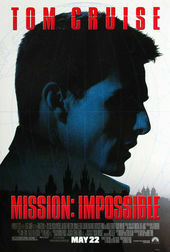 Author Andrea Codrington discusses the opening titles for Mission: Impossible, from her 2003 book Kyle Cooper: Monographics. The opening sequence to Mission: Impossible takes its cue from the 1960s television show, which always begins with a fuse being lit as a trigger for action sequences. An emphasis is put on the ﬂame and sparks by placing them tightly in frame and against a black background. As scenes from the ﬁlm ﬂash on and off the screen, interspersed with metal-reminiscent credits that glint with speed and urgency, the fuse sparks on to the end of its logical course — a visual explosion that introduces the title of the movie in bold italic serif type.